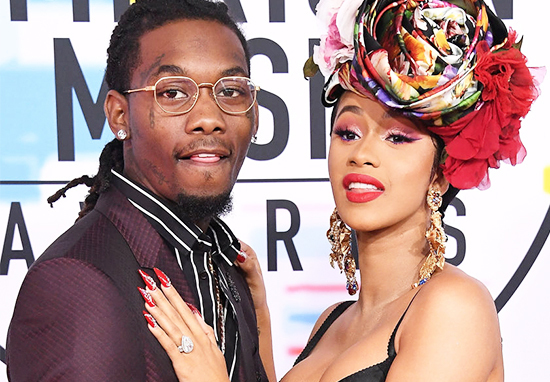 Offset interupted Cardi B on stage during a performance, putting a whole new meaning to the term ‘say it with flowers’. Cardi was a few songs into her headline set at the Rolling Loud Concert at the Banc of California Stadium Grounds in Los Angeles last night (December 15), when a sign made of flowers reading ‘TAKE ME BACK CARDI’ was wheeled on stage, followed by an apologetic Offset. I just want to tell you I’m sorry, babe. The Migos member was met with a mixture of boos and cheers as he made his way on stage, but failed to raise a smile out of his estranged wife. Cardi appeared to huff and puff as the Bad and Boujee star made his floral gesture. The couple split up earlier this month after a year of marriage. They also have a five-month-old daughter Kulture, who was born in June this year. Cardi announced the break up through a video uploaded to her Instagram page (now deleted), telling fans how the pair had ‘grew out of love’. Guys I just want to say thank you for everybody that’s been supporting me, been loving me, and they feel like they need to defend me. I don’t want people just keep doing f*ck sh*t, saying f*ck sh*t.
Violating my baby father is not going to make me feel any better. At the end of the day that’s still family. Unfortunately we [are] going through things, and you know, it’s not private it became public and I just want things to die down. I just need time so we can see eye-to-eye. I can’t predict the future, I don’t know, but the whole coming at my baby father bullsh*t that doesn’t make me feel any better. I just want to say thank you everybody for respecting my wishes. I love you so much. You’ve got to wonder about the security set up at the concert if Offset really did surprise Cardi with his stage invasion. But I guess these two have got enough on their plates without us rubbernecking any further into their business.